OPTICAL FINGERPRINT SENSOR - STQC certified single finger scanner MFS100 is high quality USB fingerprint sensor for fingerprint authentication in desktop or network security. MFS100 is based on optical sensing technology which efficiently recognizes poor quality fingerprints also. MFS100 can be used for authentication, identification and verification functions that let your fingerprint act like digital passwords that cannot be lost, forgotten or stolen. Hard optical sensor is resistant to scratches, impact, vibration and electrostatic shock. MFS100 is brand of Mantra softech - STQC, GOVT. OF INDIA certifed USB Fingerprint scanner equivalent to FBI PIV certification. About STQC - Standardisation Testing and Quality Certification (STQC) Directorate is an attached office of the Department of Electronics and Information Technology, Government of India. Apart from STQC, MFS100 is CE, FCC, RoHS, WHQL, CB 60950 approved. Equivalent to FBI PIV certification. 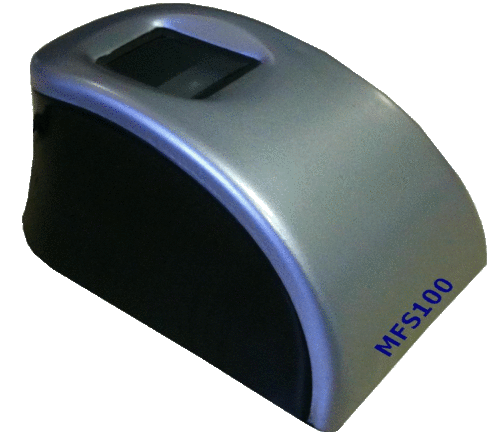 MFS100 is suitable fingerprint scanner for all Aadhaar project for Uidai(uid) project of Govt. of India. Lowest FAR and FRR NIST complied interoperable template format standards (ANSI378 /ISO19794-2). Compatibility with ISO 19794-4 and ISO 19794-2 for fingerprint capture and verification. Multi-threaded code design fully utilizing multi-core CPU power. Mantra Softech (India) Pvt Ltd is a leader in Biometric security and Business solutions. Automated Fingerprint Identification System(AFIS) and software for fingerprint identification search matching / finger print recognition are the primary products of Mantra Technologies. We provide the accuracy criminal and civil fingerprint identification search and authentication systems in the industry.